I have a confession to make. 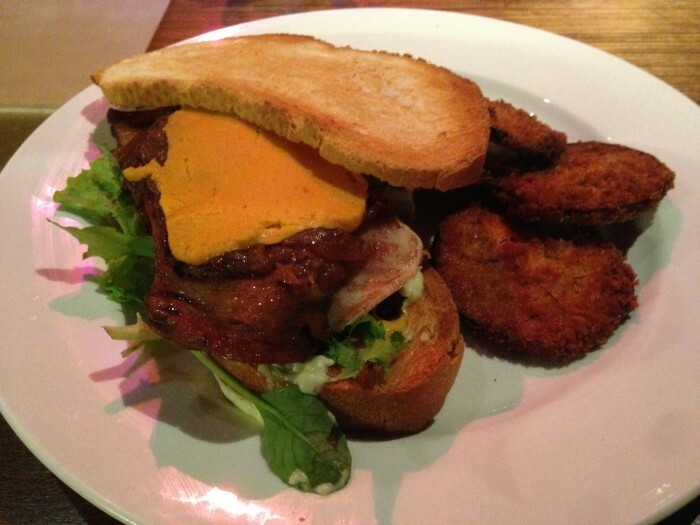 It may be hard to believe, but I am a northern suburbs vegan who has never been to the Cornish Arms…until now. I had a quick after work dinner and catchup with a friend, and was pleasantly surprised. I don’t know why, but I’d imagined the Cornish Arms as a dingy, sticky carpet kind of place. In fact it is open and airy. There’s lots to choose from on a separate vegan menu – a good range of pub food classics, as well as pizzas, burgers and desserts. It is not something I’d eat every day, but sometimes a pub meal just hits the spot. This is pretty good quality junk food. The servings are enormous, so go hungry. I had the vegan fish and chips, a tofu seaweed combo in a voluminous crispy batter, which I really enjoyed. The tofu was a good texture and made a fairly satisfying “fish”. 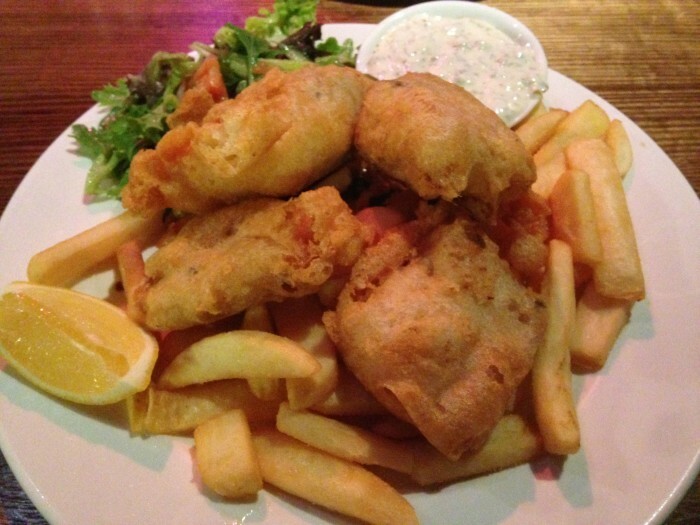 It came with great chips and a generous serve of tartare sauce. My friend had the steak sandwich. The mock meat in this was ‘duck’ and was delicious. It came with facon and cheese, though I think it would have been nicer without the cheese. But then I think most vegan cheeses are awful. It also came with some well cooked crumbed eggplant discs. The bread however was whiter than white. A decent sourdough would have lifted this to greater heights. But those small grumbles aside, all in all a good standby place for a pub meal. Not fine dining, but thoroughly enjoyable. My boyfriend and I ordered those same dishes when we visited…holy moly we had to roll ourselves out of there! Yep. We couldn’t even contemplate dessert!